A recent biennial convention of the Ontario Federation of Union Retirees (OFUR) ended on a high note last month in Port Elgin after delegates from throughout the province reaffirmed their commitments to key issues for seniors and elected its Executive Committee and Council. “Many challenges in hosting our convention evolved in building a stronger and more vibrant organisation, ready to play our role for seniors, within our province and with others nationally”, says OFUR President Suzanne Clancy. 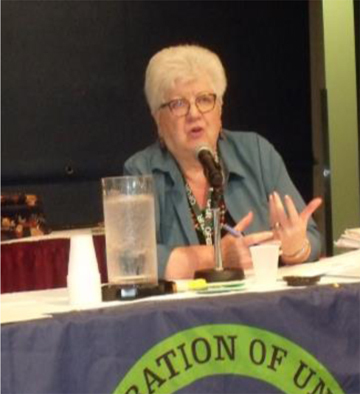 “Seniors need to stand together against the proposed onslaughts coming from different parts of the country.” Suzanne Clancy is the President of the Ontario Federation of Union Retirees (OFUR) — a provincial Federation of the CURC. OFUR delegates heard from the Ontario Federation of Labour. They heard from speakers Natalie Mehra of the Ontario Health Coalition, Rachel Weldrick from the Department of Health, Aging and Society at McMaster University and Malcolm Buchanan on workers pensions and retirement benefits. They also considered sixteen resolutions and undertook a strategic planning session. Clancy says hospital and long-term care beds, community support for seniors who want to stay in their own home, seniors’ isolation and safety, cuts to health care in Ontario, and the need for a universal drug plan dominated the discussions, along with pension issues. 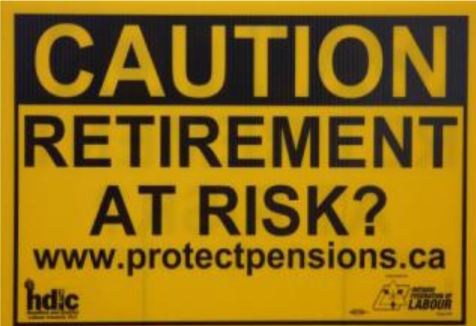 Pension lawn signs produced by the Hamilton and District Labour Council were distributed at the OFUR Convention. In a provincial election after the OFUR convention, conservative candidate Doug Ford became Premier of the province, which Clancy says is bad news for seniors in Ontario: “Ford’s proposed $6 billion in spending cuts will lead to fewer services in health and education and reduce taxes for corporations and higher income earner”, she warns. Clancy says that seniors more than ever need to stand together against similar onslaughts by federal politicians and by provincial governments, pointing to the importance of the upcoming national convention of the Congress of Union Retirees of Canada (CURC) to be held in Toronto next 19-21 September. “This will be an opportunity to galvanize the sentiments of seniors in time for the next federal election”, she concluded.